The Bicycle Library – It Works! We in Bicycle Innovation Lab have examined through a questionnaire how a bicycle library can contribute to a more sustainable transport. Experiences from the bicycle library show that by offering a wider range of cycle types and testing them in practice has the potential of encouraging more people to cycle more often. The ability to test different types of bicycles in practice in the daily transportation changes how users in bicycle library perceive their own transportation options, and can motivate more people to cycle more often, for longer distances and to use the car less. The result is that the users in bicycle library take home with them the experience the bicycle library has given them, and the majority of users are considering purchasing a similar cycle as the borrowed one. A cycle is more than just a mode of transport from A to B. 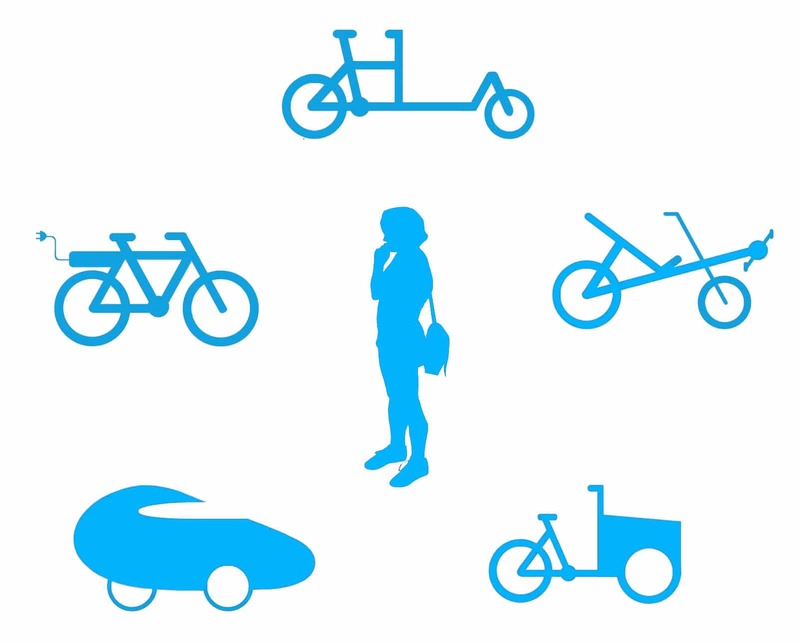 The cycle as a design object, its riding characteristics and type are also important elements in getting more people to choose the cycle over other modes of transport. The users attach different values ​​to the different types of cycles, which also means that their cycle choice is very personal. The vast majority of the library users already have a regular bicycle available, but are still searching for another type of cycle that can better meet their needs. More than half of the users come to the bicycle library because they are curious to try out a cycle with different design and different functions than what they are used to. There are also several users who come to the library to borrow a cycle because they are considering buying one similar. A few users sought out the bicycle library because they needed a cycle for a specific task. Several users are in this context interested in examining their own transportation options through one of the cycles in the library. The users are generally very excited to try out the cycles in the bicycle library in practice. 79% of users say that they have had a good or fantastic experience on the borrowed bicycle. Although the cycles in the library differ from the ordinary bicycle in form and function, the vast majority of users experience the rideability on the borrowed cycle as good, and that safety is assured. Most of the users have discovered other and more options for transportation through the bicycle library’s cycles, as other modes of transport cannot offer. The library’s questionnaire shows that more than half of the users are considering buying a similar cycle after having tested it. The cycles in the bicycle library offer different features that cover different needs. Therefore, it is necessary to try out different cycles to find out what cycle best suits your needs. By offering a wide selection of different types of cycles the bicycle library can help broaden the users’ transport horizon. A large number of users in the bicycle library combine their transport by bus, train, car, etc. The bicycle library can offer this group of users multiple transport options, so they can be more flexible in their choice of transportation, and in many cases will choose the cycle over other modes of transportation. The interest of borrowing a bicycle lies in the fact that the different cycles in the library can cover some needs that a regular bicycle can not. The Bicycle Library’s study shows that the borrowed bicycles are made ​​active in the users everyday life. 90% of the users have used the borrowed bicycle every day or almost every day. The majority of users have used the borrowed bicycle for daily transportation, including transportation to and from school or work. According to the Library’s study 46% of users say that they would cycle more and longer if they had a bicycle as the borrowed one. The bicycle library study shows that the users have cycled long distances on the borrowed bicycle, which means that the use of other modes of transport have been unnecessary. This is interesting as a study made in connection with ‘Copenhagen Bicycle Strategy 2011-2025’ shows that when the distance is over 10 km more people prefer other modes of transport such as car, train, bus than the bike. According to our survey, the commuter bicycles in the bicycle library have a potential to break this pattern and get more people to cycle longer distances than the normal comfort level of 10 km. A third of users (35%) have cycled a longest trip between 10-20 km on the borrowed bicycle, while another while yet a third (36%) have cycled a trip of 20 km and above. The bicycle library study shows that several users (20%) experience that the borrowed bicycle solves a transport need, they otherwise had to solve by car or transport. Following this point 7% of users say that they would drive less if they had a bicycle similar to the one borrowed. According to a study made in connection with ‘Copenhagen’s Bicycle Strategy 2011-2025’ many people prefer the car over the bicycle, even when the distance is between 2-10 km. The library can offer this target group a few bicycles that contains many of the car’s advantages, which have the potential to encourage more people to drive less. For example, the bicycle offers opportunities as being able to ride around town with the children, making major purchases, etc. Often there is great ignorance associated with what more advanced bicycle types can offer the user. The cycles are often more expensive to invest in than the ordinary bicycle. This means in practice many bicycle types are normally inaccessible. By making such cycles available, the bicycle library removes much of the ignorance and many of the uncertainties and prejudices that are related to these cycle types. The result is that more than half of users are looking to buy a similar bicycle as the borrowed one. Moreover the bicycles in the library motivate more people to change their mobility habits and cycling more often and longer distances. The fact that the bicycles also differ both in their design and function appeals to users, as they are very curious to try the more advanced cycles. A bicycle library can thus make a difference and contribute to more sustainable transportation.